Flame protective long johns with high insulation capability, in wool-material that secures you stay warm and dry. 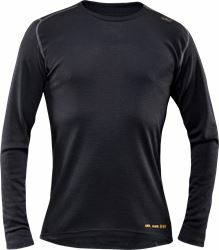 Perfect as base layer for enhanced safety and comfort. Feminine fit. Material: 50% viscose FR, 50% merino wool. 2-layer / Elasticated waist / Approved according to EN 61482-1-2 class 1 and EN ISO 11612 A1 A2 B1 C1 / OEKO-TEX® certified.